In this thou shalt know that I am the LORD: . . . EXODUS 7:17-18.
and started stinking up residential canals too…. upon the waters which are in the river, and . . . EXODUS 7:17-18.
. . . The boats dumped tons of dead fish in truck-sized bins to be hauled to the landfill. By Monday, county officials were struggling to keep up with the influx of rotting pinfish and snapper. “This is massive,” said Kelli Levy, Pinellas’ director of environmental management. And at this point, no one can say when it will end. they shall be turned to blood. And the fish that is in the river shall die, . . . EXODUS 7:17-18.
and the river shall stink; . . . EXODUS 7:17-18.
noon, Monday September 17, 2018.
and the Egyptians shall lothe to drink of the water of the river…. “Red Tide Rick has got to go,” shouted demonstrators as waves of dead fish buried beaches. … The mounting red algae bloom has killed more than 100 tons of fish (along with sea turtles and manatees), shutting down tourism in scenes that resemble science-fiction apocalyptic scenarios. So, what would be the cause of these Red Tides? Could it be due to Global Warming or Climate Change? Nevertheless, if that were true then, these global warming and change in climate affects would have been part of the cause thousands of years ago as well because the Red Tides today would be the same phenomena of the first plague that Moses described in the Pentateuch that eventually led to the Exodus. However, today we have the benefit of knowing more about these Red Tides that have been occurring from time to time and in different areas of the planet earth. In fact, just two years ago, Florida experienced another Red Tide and it was reported the cause of this was due to Hurricane Matthew that moved up the Florida coast and up further to wreak havoc in the state of North Carolina too. And, although todays’ reports have not stressed a point, in that, there happens to be a pattern that regards certain Red Tides in a connection with other phenomena such as hurricanes. Some reports state that this recent Red Tide in Florida actually began in October or November of 2017. Obviously, it was not until after the Red Tides continued to remain significant months later that it became necessary to give much better news coverage. Therefore, the situation has become so terrible that it also reveals that this particular Red Tide has become much more severe than the one sparked by hurricane Matthew in October 2016. The last episode of Red Tides that was severe in Florida occurred over a decade ago around 2005. So now, with this kind of information and due to my past research, there are some other conclusions that may be important to know. Just as it becomes factual in that high tides are associated with our moon phase, so would be many other phenomena that occur on this planet. Indeed, there are many references in the Holy Bible that show these star associations. One major account was detailed in the Gospel at the time of the Crucifixion of Christ. It was said that there was a TOTAL SOLAR ECLIPSE that lasted for three (3) hours and from 6:00 PM until 9:00 PM and then immediately afterwards, there was an earthquake. And, as a matter of scientific fact, this description of how certain eclipses can spark other phenomena such as earthquakes, tsunamis, volcano eruptions has been common knowledge in the scientific world for thousands of years. So why then do we not learn about these wonders in school!? However, because part of understanding science would be byway of observation so, maybe we can learn something today on this wise. Even though a possible correlation has not been widely broadcasted that regards the extensive Florida Red Tide in 2005, though, on December 26, 2004, there was a catastrophic underwater earthquake that set off a massive tsunami near Indonesia upon which it was reported that the entire earth was affected. That next year in August 2005 came the category 5 hurricane Katrina. Could these events be connected as sort of a chain reaction that also resulted in the lingering effects of the 2004-5 Red Tide? Although there were other Red Tides that came into the Florida’s coastlines especially in 2011, 2014, and 2016, however, the Red Tide today, brings to mind the 2004-5 Red Tide that was also persistent and lasted for several months. The devastating outcome of this present hurricane Florence that brings epic flooding to the state of Florida, though, did not come near to Florida as opposed to the 2016 hurricane Matthew that moved up from Florida into North Carolina. As for the Red Tide presently, what has been left out of the reports would be that if it began in October of 2017, then it did so just after a major celestial event did occur. On August 21, 2017, THE GREAT AMERICAN TOTAL SOLAR ECLIPSE crossed over America. And it was almost immediately after this three (3) hour long phenomena occurred that there were at least three intense hurricanes stirred up from a tropical depression directly because of this incredible eclipse. Hurricane Harvey made landfall in and around Houston, Texas and shortly thereafter in September, Hurricane Irma made its way into Florida not long after it was said to have demolished the island of Puerto Rico. Around that same time span too, there was a special type of planetary alignment that occurred in the month of September as well. So therefore, it seems like this widespread Red Tide actually began to appear on the Florida coastlines because of hurricane Irma and the other planetary events that occurred leading up to this hurricane. Just as it has been in the distant past, natural phenomena can set off a domino effect of other events to occur but that does not mean it will be the very next day! For instance, a planetary alignment could trigger an earthquake immediately afterwards and also, simultaneously trigger another series of celestial events that may not occur for years and years to come! The ancient Egyptian priest-scientist, Imhotep, and others knew how to predict events to occur even long past their lifetime. Over the past centuries and before, there have been global and planetary patterns that are studied and this kind of science helps to prepare humanity to obtain a better quality of life. So therefore, the information of these Red Tides in how it was detailed thousands of years ago by Moses could be beneficial to know, but for some strange reason, our scientist avoids this correlation as if it is – a plague! But then too, due to other recent events happening in the political arena of Florida and America, these Red Tides, could lead to just that--- a correlation to Moses---and our government may have chosen to keep this kind of association civil conflict that surrounded the Biblical account of Passover quiet. Just the idea that some of the Haitians, Afro-Caribbean and African American descendants of Slaves could possibly have any connection to Moses, sounds remote based on our education and classification here, but then HEY—It could very well be the Elephant in the Room. My governor leaves a lot to be desired, but he is characteristic of a much larger problem with politic in the country. Red tide is a serious problem. But this is nothing compared to what is in store for this world. That said the articles are alarmist especially the way they have been presented here. 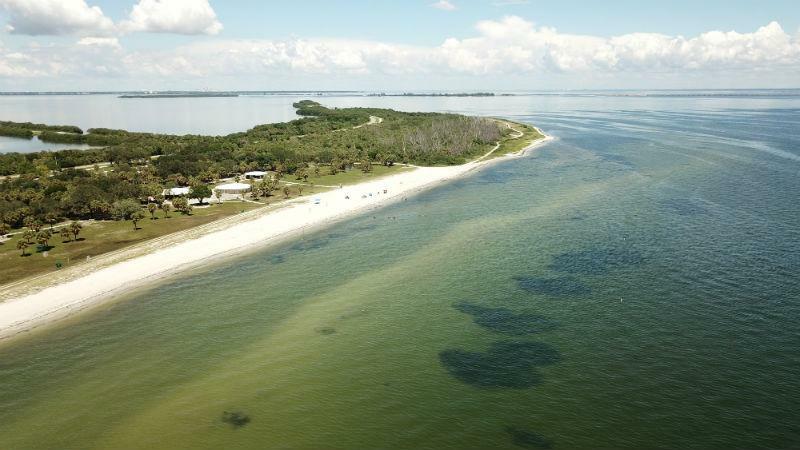 I read one of the articles, if gives the impression that Red tide has hit Fort Desoto beach (it has not, but it is nearby), which is one of my favorite beaches. One of the reasons I like it so much is that I can go there and be the only person there. That is just the way the beach is there are no bars or hotels, you have to pay a toll to get there and $5 to park to a lot of locals go to other beaches where there is more action. The water is also full of fish, which some people don't like. The fact that the beach is empty comes as no surprise to me. But the article does not say this, rather it will have you infer that red tide has sacred people away; where the reality is that it is just the dearth of bars. So you think this toxic red tide is just one of the Great Judgements? Many people were saying that the waters in the gulf that turned red from that underground gas and oil well leak back in 2010 was a sign of Revelations about the waters turning to blood.....but it came and went and many of those who were in power then are STILL in power. @Pioneer1 I've been preached to about the end of times since i was a child. I have to admit, 45, climate change, and other factors do make you wanna go hmmm. Still the areal photo and caption from the Times I posted above is VERY misleading. This is just the thing that people who believe in Revelations latch on to, despite the fact that every generation finds reasons to believe the end is near... here too reason, facts, logic, and history have no place. Well that's the thing, and quite frankly it's one of the things that turned me away from organized religion. Since I was a kid they were predicting the end of the world. Then I foud out that generations before me going back hundreds of years each generation thought THEY were the generation that would see the end. Meanwhile the rich people and those in power kept right on doing what they were doing and running the world. I soon recognized organized religion as a sort of pacifier or drug used to keep people calm and sedated and WAITING....WAITING....WAITING....on something to happen to improve their society instead of MAKING it happen themselves. Many people believe that because Trump is in the Whitehouse he will make things so bad that the world will end. The problem with that type of thinking is that they said the same thing about George W. Bush.....and the world DIDN'T END. @Troy Sounds so dreamy, and after visiting some of the beaches in Florida, I can understand how peaceful that beach really is. Florida is surrounded by beaches though. In Central Florida, i can reach both directions in just about less than an hour! Daytona Beach is so awesome. I grew up going to Virginia Beach all of the time when I lived there as a child, but Florida trumps Virginai Beach! However, the cost of living is high in Florida. Man! There are so many oasis where the majority are White people. Therefore, i am wondering why sometimes the news reports seems to not reflect the whole truth as you stated here. Is it propaganda to keep the tourist or certain people away from certain beaches? The Red Tide is not affecting the entire coast, but due to the recent protest, I suspect that it is a significant problem now. That is what I am highlighting. Yes, I agree that, in regards to the global issues, the Red Tide is nothing . . . It is nothing when it is considered singly . . . but in the scheme of the global issues, it may be an economical issue that may become significant, if it continues to happened on a large scale as in 2004 and this year. @Pioneer1 LOL. That one word 'Judgment' and then the other 'Revelations' are words that I try to avoid for certain current events because that kind of conditioning blinds the bigger truth. I tried to highlight the presence of Red Tides as they have been occurring for thousands of years, off and on, in different parts of the globe . . . and I had hoped to show that this phenomena was not the first time occurrence even in ancient Egypt. LOL. FINITE ENDING OF TIMES is deliberately omitted so as to make us ignorant. Well, I pinpointed certain aspects of this phenomena mainly THE PROTESTING. The photo you presented, I saw that, and I also saw the other reports too but chose not to highlight it for now, concerning the ECONOMICAL aspect of the resort beaches that had a significant impact due to little or no tourist for the recent LABOR DAY WEEKEND. So, even though that beach was 'a bar' and the bar near the condominium was also 'a bar' with dead fishes pictured, I think the people lined up along the beaches and the protests due show that the economy is hit. The rotten smell and the tons and tons of dead fish, is a serious problem. So all in all, this one private beach that may seem misleading doesn't stop the bigger picture. @Chevdove, red tide is indeed a serious problem -- devastating to those financially impacted. I'm just pointinging out, as with all bad news, the media exaggerates these things, making it hard to gain perspective.